6.4 Decimal Path-index is a Decimal Path-index for the 6th/32 Path-indexes: Tiphereth. 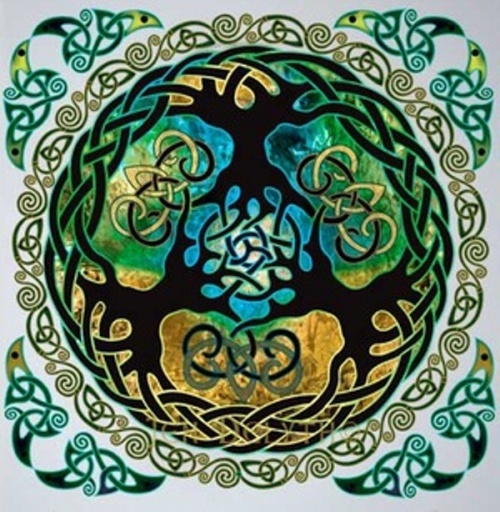 Yggdrasil is the world tree of Norse Mythology, the giant ash tree that links and connects all the known worlds, the axis, the center of the creation of the Universe. 3 roots connect the world tree to the 3 wells that flow beneath. The well of mimisbrunnar also called mimir whose waters are the source of all wisdom, the well of fate - urarbrunnr/urdarbrunnr, guarded by the Norns and the well of hvergelmir - roaring kettle, the source of many rivers that nourish life. "Hope deferred maketh the heart sick: but when the desire cometh, it is a tree of life" Proverbs 13:12. "We hold these truths to be self evident..."
1st/3 branches of the tree of life in objectivist terms is the axiom of being. 6.4.1.1 DPI: 1st/3 branches (שריגם), the trunk is the FuXi LongXih (伏羲 龍解) 1st/6 LiuShiSiGua (六十四卦); 64 truth configurations of divinatory symbols, the 1st-2nd/4 FuXi sequences (卦序; GuaXu), is executing the order of the sequence of the 64 Xi (羲). Through the process of untying FuXi LongXih (伏羲 龍解) proceeds the order called LongTu BaGua (龍圖 八卦) and through the process of tying FuXi LongXih (伏羲 龍解) precedes the TianYi BaGua (天易八卦) placing the FuXi LongXih (伏羲 龍解); parsed: Fu (伏); “crouch, crawl, lie hidden, conceal or prostrate” and Xi (羲); “breath or vapor,” and Long (龍); “dragon and Xih (解); “loosen, untie, explain or solve”, is all composing a total meaning of “hidden breath or vapor of the dragon solution or explanation,” peripheral to the BaGua as legendarily devised by FuXi (伏羲) the Chinese historical figure of BC AYN 2760-BC AYN 2697. FuXi (伏羲): 2nd/3 branches of the tree of life, with specifics of the Mayan World of Wind or Seed, with the 1st/64 Xie (חיה): KunXie (坤羲) to the 2nd/64 Xie: BoXie (剝羲) through to the 63rd/64 Xie: GuaiXie (夬羲) and finally the 64th/64 Xie: QianXie (乾羲), all corporeal entities. The TianYi BaGua (天易八卦) is interwoven within the 2nd/6 LiuShiSiGua (六十四卦); 64 (נ-ו-ח) truth configurations of divinatory symbols by the process of FuXi LongXih (伏羲 龍解); earth to heaven with correct dynamics BaGua extensions launching centrifugal dragon. FuXi (伏羲): 3rd/3 branches of the tree of life, with specifics of the Mayan World of the Jaguar, with the 1st/64 Hui (חוי, 희): GaunHui (건희, 乾羲) to the 2nd/64 Hui: GuaeHui (쾌희, 夬羲) through to the 63rd/64 Hui: BakHui (박희, 剝羲) and finally the 64th/64 Hui: GonHui (곤희, 坤羲), all incorporeal entities. The LongTu BaGua (龍圖 八卦) is interwoven within the 2nd/6 LiuShiSiGua (六十四卦); 64 (נ-ו-ח) truth configurations of divinatory symbols by the process of FuXi LongXih (伏羲 龍解); heaven to earth with turtle writing BaGua extensions landing centripetal dragon. The FuXi LongXih (伏羲 龍解) is the first LiuShiSiGua (六十四卦); 64 truth configurations to occur cosmologically and the processor of the Big bang when considering the cosmos as a huge super computer, the "macro-computer," in the sense of “as the dragon unties” (LongXih 龍解) or post symmetry breaking the big bang commences and proceeds, the launching centrifugal dragon. The "micro-computer" is the self-programmable vacuum (or God’s) computer, the first holon. With the history of artificial intelligence, the birth of AI (אי; "isle or island") is the bullseye of the Dartmouth Conference of AD 1956 with the assertion: "every aspect of learning or any other feature of intelligence can be so precisely described that a machine can be made to simulate it," the moment that AI gains a name (Ai: עי), a mission, a first success and major players. The IBM 702 is a computer with usage by the first generation of AI researchers. The FuXi LongXih (伏羲 龍解) is referred to in Revelation 22:2: “In the midst (בתוך) of the street (רחוב; "width-ing" or "wideness") of it” (העיר), it being the throne (כסא), is there the tree (עץ) of life (חיים). This tree of life is also referred to as being “on either side of the river” (הנחל), a reference to the 2nd branch (שריגמה) and the 3rd branch (שריגמא) of the tree of life, making FuXi LongXih (伏羲 龍解) the formula, pattern or blueprint branch, the 1st branch (שריגם), the trunk of the tree of life, which bare 12 manner of fruits, and yields her fruit every month: and the leaves (ועלה) of the tree are for the healing (תרופת) or medicine of the nations (גוים). FuXi LongXih (伏羲 龍解) relative to String theory is unoriented open and closed strings Type I, 1st/5 of the basic number of superstring theories. FuXi LongXih (伏羲 龍解); "prostrate breath dragon construe (שטרוה) or compile" is with specifics in Korean as DoHae (圖海, 도해, דוחה; “her chase”); the “image or diagram [of the] sea,” or “sea diagram.” Hae (해) of DoHae (도해) is the same Hae (해) of the sea king star (שטר); Korean: HaeWangSeong (해왕성); Mandarin: HaiWangXing (海王星); “Neptune.” DoHae is cognate with the name of the capital of Qatar: Doha with the meaning in Arabic as the “big tree.” This is also the source code for the acronym DOE; “Department Of Education” through the Hebrew root-stem of DoHae (도해, דו-חה) normalized in Hebrew as DOH (דוח); “chase” (chacier) colloquialized as DOE with the Hebrew form EDUCT (הדוחת) normalized in English as educate (הדוחתה). The original image construct (שטרוך) FuXi LongXih (伏羲 龍解) is identified with the Korean HwangGung (황궁: הוענג-כענג); Chinese: HuangKong (黃穹), Olympian: Poseidon (צידן); Neptune, Sumerian: EA (הע); "house of water," construe (שטרוה) as “yellow elevated vault,” with the spell in Hebrew of Resh-Tzadde-Pe (רצף); "pavement," the topological western slice of a cube in the Universal Syphers™ theme, Hebrew anagram: founder (צרף). HwangGung (황궁: 黃穹) is the legendary Asian figure with rulings BC AYN 9175 through BC AYN 8176. Pathologically DOE/DOH (דוח) is with the spell in Hebrew of Daleth-Vau-Heth triangulating those 3 paths topologically within the Universal Syphers™ theme forms the azure vault (ועולת), the topological eastern slice of a cube, identified with the Korean CheongGung (청궁); Chinese: QingKong (靑穹), the Olympian: Zeus, the younger brother of Poseidon. The untying (launching) of FuXi LongXih (伏羲 龍解) through the process of creation or evolution (לנוס: Linneus); “to flee” results in "natural news" (נוס); “fleeing” whose Hebrew root-stem is NS (נס); “flee” (בלהה: Bilhah, the mother of Naphtali and Dan) the two paths Nun-path (נ, Naphtali) and Samekh-path (ס, Dan) which specify the decompactifying during the process of untying (or tying) the FuXi LongXih (伏羲 龍解) or DoHae (圖海). In the case of tying (landing) of FuXi LongXih (伏羲 龍解) through the process of re-creation which specify the compactifying during the process of tying the FuXi LongXih (伏羲 龍解) or DoHae (龍解). NS (נס); “flee” (בלהה) also means Nes (נס); “pole” the Hebrew root-stem of Nesa (נסה); “tempt,” “prove,” “assay” or “test,” and Kanes (כנס); “gathered,” the root of the modern Knesset (כנסת); “gathering,” the unicameral legislature of Israel, see BC AYN 1279. NS (נס); "Nun-Samekh" with Greek is Nesi (νησι); "island." The FuXi LongXih (伏羲 龍解) establishes the absolute eternal relationship between the 64 symbolic hexagrams and 64; 40 Minor cards, 12 Face or Court cards, 8 Pre-Heaven BaGua (八卦) Major cards and 4 knights Templars, of the image Tarot cards is with a direct one-to-one correspondence. The tzimtzum (צמצום) reveals the Ten Sefirot/Sepherot (ספרות) in transcendence the 1st time or context, in Asian terms ShiGan YinYang (十干 陰陽); the “10 shields, spheres or doings of Yin (陰) even numbers and Yang” (陽) odd numbers echoing the first verse in Genesis 1:1: “God created the heaven and earth;” Yang (陽) and Yin (陰), the two essential elementary forms or genders with the ten value-archetypes through which the creator or Deity creates and structures the world of ten emanations of visible light, and these are first expressed through the Iggulim(עגלים); concentric “circles” within the FuXi LongXih (伏羲 龍解), linking the Qabalah (קבלה) and the Aristotelian system of heavenly spheres with the 8 concentric rings of the FuXi LongXih (伏羲 龍解). Iggulim (עגלים): eagles echoes Luke 17:37: "Wheresoever the body is, thither will the eagles be gathered together," in one place, the "gathering place," the FuXi LongXih (伏羲 龍解). With basic Yin-Yang quantum philosophy heaven to earth; the spoke or pillar of QianXih, the heavenly Yang polarity and the spoke or pillar of KunXih, the earthly Yin polarity compassing 8 concentric rings with the likeness of the Ain Soph (אין סוף) tzimtzum (צמצום) 10 concentric circles or rings utilizing the order of 1 most external through 10 most internal the first 40 hexagrams external to internal are the 40 Minors; 4 X 1 through 10 Minors. Out of DaWuGan (大戊干), “out of the void (בהו) comes the Tai Chi, God’s input,” the Tai Chi (太極) is the primary Li (里); "reason" in the formation of the universe, echoing the statement; “Pi Phi Li” where Pi (π) is the circumference of the “big” circle, most external ring; Phi (Φ) is the phi geometry that connects the inside (non-local vacuum, the void), most inner ring with the outside (local states of becoming); that is base-9 (celestial coordinates) with base-10 (terrestrial coordinates). Here Li (里) is the logic of beyond all human logic, which is God’s input logic, the TaiJi (太極). The first 40 hexagrams are the 40 Minor Arcana cards interwoven with the 8 Pre-Heaven BaGua (八卦) Major Arcana cards compassing the outer 6 concentric-rings followed by the inner 2 concentric-rings 16 hexagrams of the 12 Face or Court cards and the 4 knights Templars completing the 56 Minor Arcana cards with the 8 Major Arcana cards totaling 64 hexagrams of the FuXi LongXih (伏羲 龍解). Just as the Emanations emanate 1 through 10 in the FuXi LongXih landing Centripetal Dragon order (1st Israel) with the Pre-heaven 8 Major Arcana cards; the outer 6 concentric-rings, the first 58 hexagrams, so too are the 12 Face or Court cards and the 4 Knights Templars succeeding to the inner 2 concentric-rings with the final 16 hexagrams. The continuum order of the final 16 hexagrams with 12 Face or Court cards and 4 Knights Templars are ordered with the Yang odd numbers of Kings-13 and Jacks-11 and with the Yin even numbers of Queens-12 and Knights Templars-14 synchronized with the Queen of Wands, the Chinese month of the rabbit as JianXih (蹇解); "limping or lame," a "lucky rabbit foot" with the Knights Templar of Coins as YuXih (豫解); "providing-for or foresight," a "white knight." The results oriented program is one Major Arcana Pre-heaven BaGua and Yang 1,3,5,7,9 & 13,11 per spoke or pillar times 4 suits and the same for Yin. Neptune Breathing Solution is with the FuXi LongXih Launching Centrifugal Dragon order (2nd Israel) diagram resulting in the inverse order of Yang 11,13 & 9,7,5,3,1 with one Major Arcana Pre-heaven BaGua per spoke or pillar times 4 suits and the same for Yin. FuXi LongXih (伏羲 龍解) is with practical application for operating and understanding thermonuclear fusion power using magnetic fields to confine the hot fusion fuel in the form of a plasma with two basic types of field generation: magnetic confinement fusion (MCF) and inertial confinement fusion (ICF). 2nd/3 branches of the tree of life in objectivist terms is the axiom of identity illustrated with the World of Wind or Seed. Xia (上) upper FuXi (伏羲) XianTian (先天); "former heaven," was ordered by ShaoYong (邵雍) of the 11 century AD: 1011–1077 who edited the TaiXuanJing (太玄經); “Canon of Supreme Mystery” (53 BCE-18 CE) or more concisely the “great black classic” by YangXiong (揚雄 circa 10 AD) subsequently influenced by the Base 3 numeral system found in the TaiXuan (太玄), ShaoYong then set the Hexagrams of the I Ching (YiJing); “dynamic warp or pass through” (Ancient Greek: δυναμικος: דענמך) classic into a binary order now called the FuHsi (伏羲: FuXi) former heaven ordering composing the upper branch sequence. The Xia (上) upper FuXi (伏羲) XianTian (先天); "former heaven," relates to String theory with the closed Type IIB. 260th/260 globalized (historical) Katuns (קטן), Quantum Numeral Baktun (QNB) 12.19.0.0.0 covering the proleptic Gregorian calendar period of time of AD 1993, April 5 through AD 2012, December 20, the 20th/20 katuns occurring during the 13th/13 Baktuns of the National Underworld is the globalized (historical) Katun (קטן) period when the destruction of the 4nd/4 Mayan worlds of fire by Cauac (חוך) occurred. After the destruction of the 4nd/4 Mayan worlds of fire-rain by Cauac (חוך) , begins the 1st/4 traditionally interpreted worlds of wind or the mathematical world or Kan (קן); "seed or lizard." The 1st traditional world of wind called Ix (יך) is the world of Tzoncuztique; "golden age," is actually the mathematical world of Kan (קן) seed or lizard represented by the 1st/4 positions of the SiXiang (四象); "four positions" of XiaoYin (小陰), the digram or bigram of "young Yin" (|¦) whose latter end (אחריתה) as the 65th/260 Tzolkin-I Ching is "as bitter as wormwood" (כלענה) and itemized in the Universal Syphers™ as the Fu Hsi or FuXi (伏羲) XianTian (先天); "former heaven" sequence decimal 63 through 0, the 2nd/3 branches of the tree of life (ועץ החיים), the 24th/32 Path-indexes: Nun-path. Tzolkin (צול-קין); semantically means: "shadowing (to cause to take) possession," of which tzol- (צול) is "shadowing" combined with KIN (קין); (to cause to take) possession, the command imperative form of KN (קן). Phonetically shadow is referenced in Genesis 31:47 as sahadutha (שהדותא); shadow-tha with the local dialect suffix of Laban's language or "shadows" whose Hebrew root-stem is SHD (שהד); "witness" which is called in Jacob's language ID (עד); "witness" and in other occurrences "congregation" and sometimes spelled in English as ed (עד). Shadutha (שהדותא) combined with Jegar (יגר); "heap" in Laban's native tongue and GL (גל) in Jacob's Language is Jegarsahadutha. The 1st world of Kan (קן) seed or lizard is the macro-FuXi (伏羲) command order sequence of 64 Xi (חי) characters or letters that are in Hebrew AGRUTh (אגרות), the XianTian (先天); "former heaven" order of the YiJing (易經) plus the XiaoYin (小陰); "young yin" (|¦) bigram altogether 65 characters or letters composing the 2nd/3 branches of the Tree of Life (ועץ החיים). The macro-FuXi (伏羲) is referred to as the DaChu (大畜); "large or big accumulating, big pile-up or big heap" (גל/גר), the 58th/64 in the index order (6.4.2.57 DPI), macro-FuXi or the DaChu (大畜) FuXi (伏羲). The 3nd/3 branches, the 6.4.3 DPI decimal path-index of the Tree of Life is the XiaoChu (小畜) FuXi, the "small accumulating, small pile-up or small heap" (גל/גר), the 5th/64 in the index order (6.4.3.4 DPI), micro-FuXi. The Tzolkin round is the form of the pre-existing program application coding algorithm mapping for the filtration abstract design structure address matrix (מטריך) of the divine light creation. The Tzolkin inner nature describes the pre-set divine program background coding of the command order sequence process energy matrix (מטריך) protocol. The Shang (上) lower FuXi (伏羲) XianTian (先天); "former heaven" 6.4.2 DPI uses the earth to heaven order sequence illustrated with decimals 63 through 0 the upper Nun-path (נפת) vector and whose latter end (אחריתה), the 65th constituent is bitter (םרה) and attached to the sun via XiaoYin (小陰); young Yin (¦|), the numeral one (ענה) of the SiXiang (四象). The Shang (上) upper FuXi (伏羲) XianTian (先天); "former heaven" located in 6.4.2 DPI is involuted to the Xia (下) lower FuXi (伏羲) located in 6.4.3 DPI. Within theShang (上) upper FuXi (伏羲) XianTian (先天); "former heaven" there are 8 clustering algorithms, in the earth to heaven direction, the result of the explicitly unfolding, untying or loosening decompactifying launching centrifugal dragon (Earth to Heaven; Correct Dynamics) FuXi LongXie (伏羲 龍解), the 1st/3 branches or the trunk of the tree of life, see 6.4.1 DPI decimal path-index. These 8 different clustering (萃, קוי) algorithms all together (אשכלתיה); eight times around the BaGua (八卦) or individually (אשכול); one time around the BaGua (八卦) have two main categories of design structure matrices: structure address matrix (SAM) static-spatial and command order sequence (COS) time-sequential based. Static-spatial DSMs represent systems where all of the elements exist simultaneously (co-existence), the ordering of the FuXi (伏羲) indicates a flow through space and are viewed right to left. In time-sequential based DSMs, the ordering of the FuXi (伏羲) indicates a flow through time (integration) also viewed right to left. 3rd/3 branches of the tree of life in objectivist terms is the axiom of consciousness illustrated with the World of Jaguar. Xia (下) lower FuXi (伏羲) XianTian (先天); "former heaven," was ordered by ShaoYong (邵雍) of the 11 century AD: 1011–1077 who edited the TaiXuanJing (太玄經); “Canon of Supreme Mystery” (53 BCE-18 CE) or more concisely the “great black classic” by YangXiong (揚雄 circa 10 AD) subsequently influenced by the Base 3 numeral system found in the TaiXuan (太玄), ShaoYong then set the Hexagrams of the I Ching (YiJing); “dynamic warp or pass through” (Ancient Greek: δυναμικος: דענמך) classic into a binary order now called the FuHsi (伏羲: FuXi) former heaven ordering composing the lower branch sequence. The Xia (下) lower FuXi (伏羲) XianTian (先天); "former heaven," relates to String theory with the closed Type IIA. 130th/260 globalized Katuns (קטן), Quantum Numeral Baktun (QNB) 6.9.0.0.0 covering the proleptic Gregorian calendar period of time of BC AYN 570, July 7 through BC AYN 550, April 16, the 10th/20 katuns occurring during the 7th/13 Baktuns of the National Underworld is the globalized Katun (קטן) period when the destruction of the 2nd/4 Mayan worlds of water by Muluc (מולך) occurred. After the destruction of the 2nd/4 Mayan worlds of water by Muluc (מולך), begins the 3nd/4 worlds of the jaguar. The 3rd world of the jaguar called Ix (יך) is the world of the white-haired giants, represented by the 3rd/4 positions of the SiXiang (四象); "four positions" of XiaoYang (小陽), the digram or bigram of "young yang" (¦|) itemized in the Universal Syphers™ as the Fu Hsi or FuXi (伏羲) XianTian (先天); "former heaven" sequence decimal 128 through 191, the 3rd/3 branches of the tree of life (ועץ החיים), the 25th/32 Path-indexes: Samekh-path. Tzolkin (צול-קין); semantically means: "shadowing (to cause to take) possession," of which tzol- (צול) is "shadowing" combined with KIN (קין); (to cause to take) possession, the command imperative form of KN (קן). Phonetically shadow is referenced in Genesis 31:47 as sahadutha (שהדותא); shadow-tha with the local dialect suffix of Laban's language or "shadows" whose Hebrew root-stem is ShED (שהד); "witness" which is called in Jacob's language ID (עד); "witness" and in other occurrences "congregation" and sometimes spelled in English as ed (עד). Shadutha (שהדותא) combined with Jegar (יגר); "heap" in Laban's native tongue and GL (גל) in Jacob's Language is Jegarsahadutha. Jegar (יגר) is the Hebrew root-stem of Jaguar (יגור); "was journeying" the 15th/20 Mayan Tzolkin glyphs Ix (יך); "jaguar" (כנמר) and in the Aztec Day sign called Ocelotl; "jaguar." The 3rd world of the jaguar (יגור); the "heaping" of Laban's native tongue is the micro-FuXi (伏羲) command order sequence of 64 Xi (חי) characters or letters that are in Hebrew AGRUTh (אגרות) the same root of Jegar of GR (גר), the XianTian (先天); "former heaven" order of the YiJing (易經) plus the XiaoYang (小陽); "young yang" (¦|) bigram altogether 65 characters or letters composing the 3rd/3 branches of the Tree of Life (ועץ החיים). The micro-FuXi (伏羲) is referred to as the XiaoChu (小畜); "small accumulating, small pile-up or small heap" (גל/גר), the 5th/64 in the index order (6.4.3.4 DPI), micro-FuXi or the XiaoChu (小畜) FuXi (伏羲). The 2nd/3 branches, the 6.4.2 DPI decimal path-index of the Tree of Life is the DaChu (大畜) FuXi, the "large or big accumulating, big pile-up or big heap" (גל/גר), the 58th/64 in the index order (6.4.2.57 DPI), macro-FuXi. The Xia (下) lower FuXi (伏羲) XianTian (先天); "former heaven" uses the heaven to earth order sequence illustrated with decimals 128 through 191 for spatial considerations and the inverse order sequence decimals 191 through 128 for temporal considerations both lying on the lower Samekh-path vector. The Xia (下) lower FuXi (伏羲) XianTian (先天); "former heaven" located in 6.4.3 DPI is involuted to the Shang (上) upper FuXi (伏羲) located in 6.4.2 DPI. Within the Xia (下) lower FuXi (伏羲) XianTian (先天); "former heaven" there are 8 clustering algorithms, in the heaven to earth direction, the result of the implicitly infolding (מתלקחת, root: לקח), tying or tightening compactifying landing centripetal dragon (Heaven to Earth; Dragon Diagram or Picture) FuXi LongXie (伏羲 龍解), the 1st/3 branches or the trunk of the tree of life, see 6.3.1 DPI decimal path-index. These 8 different clustering (萃, קוי) algorithms all together (אשכלתיה); eight times around the BaGua (八卦) or individually (אשכול); one time around the BaGua (八卦) have two main categories of design structure matrices: structure address matrix (SAM) static-spatial and command order sequence (COS) time-sequential based. Static-spatial DSMs represent systems where all of the elements exist simultaneously (co-existence), the ordering of the FuXi (伏羲) indicates a flow through space and are viewed right to left. In time-sequential based DSMs, the ordering of the FuXi (伏羲) indicates a flow through time (integration) also viewed right to left. History of artificial intelligence; AI (אי); "Isle or Island"
↑ The first draft of this work was completed in 2 BCE (in the decade before the fall of the Western Han Dynasty). This text is also known in the West as The Alternative I Ching and The Elemental Changes.